Early in his career Poussin traveled to Italy and was introduced to a circle of important Roman patrons including the antiquarian Cassiano dal Pozzo. Poussin’s classicism, nurtured by his knowledge of antique literature and art, was warmed by his study of Venetian painting. Venus and Adonis reveals the influence of Titian in composition, coloration, and mood. The composition is built in a series of opposing diagonals, highlighting Venus’s shapely limbs and soft belly and casting the lovers into shadow, foreboding Adonis’s imminent doom. According to Ovid’s Metamorphoses, Venus and her mortal lover Adonis sought the shade of a poplar tree during an interlude from the hunt. The goddess mingled kisses and words, telling Adonis why she forbade him to pursue dangerous, wild animals—her mortal enemies. 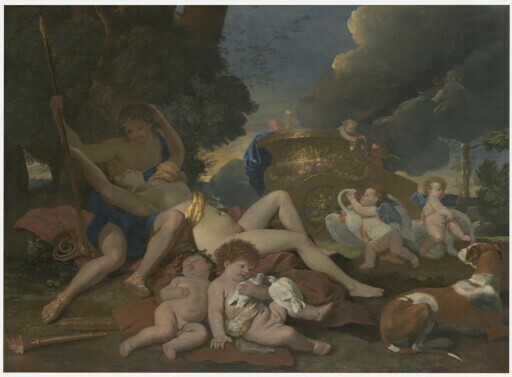 The lovers are attended by a host of putti who prepare Venus’s golden chariot. A pair of reclining putti, along with a couple of billing doves, mimic the lovers’ postures. Lance in hand and helical horn and dog nearby, Adonis is ready to disobey Venus and heed the call of the hunt. The tragic outcome––for Adonis is killed by a wild boar––is foreshadowed in the sleeping putto, unattended torch, and menacing clouds. Adonis wears a wreath of anemones, the flower that Venus would create in his memory by sprinkling his blood with nectar. An x-radiograph of the painting reveals numerous pentimenti that attest to the choices Poussin made in developing this composition. The fact that so many changes exist supports the view that the Kimbell’s painting is the primary version of the composition that inspired several copies. The artist originally conceived of a red canopy above the figures and had placed a putto writing on a tablet to the left of the figures. The hunting horn was moved to compensate for the elimination of this putto. With these changes Poussin appears to have simplified the composition and placed even greater emphasis on the figures of Venus and Adonis. Poussin painted on a canvas that was prepared with a red-brown ground. With time the tonality of the ground has become emphasized in thinly painted passages, as is often observed in his paintings due to the increasing transparency of aged paint layers. In Venus and Adonis this is apparent in the foreground and in the figure of Adonis. The phenomenon may also account for the exaggerated tonal differences in the artist’s depiction of Venus, between the opaquely painted lights and the thinly painted shadows. Possibly in the Dal Pozzo collection, Rome, to after 1740. (Novar sale, Christie, Manson & Woods, London, 1 June 1878, no. 77, purchased by Dyer for £53.11).